Patricia Trick Hooning obituary Patricia (Patty) Trick Hooning passed away peacefully on July 16, 2012 in Palm Desert, Ca. She and her husband, Burton (Burt) Trick, started their business in Santa Maria as “Home and Garden Tricks” in 1949. When a floral shop was added to the nursery and landscape business in 1953, it was known as “Trick's Nursery and Florist.” In 1963, the growth of the floral shop led the Tricks to devote all their time, effort, and store space to its operation, and the nursery portion was sold to make room for expansion and remodeling. It was then renamed “Trick's Florist” and that business remained in operation until 1983, when it closed due to the passing of Burt Trick. Rose of Sharon Florist continues to this day in the same location on East Main Street. Patty was active with Burt during their years in business in industry associations ??" presenting papers and giving talks at professional meetings, writing for trade journals and commentating at floral design shows. They worked as a team in giving floral career seminars at university floricultural departments, as well as business seminars for state industry conventions around the country. Patty served as a national committeewoman for Florists' Transworld Delivery Association (FTD) on the Special Services Committee. She also served at different times as a Board member for FTD District 10-A. 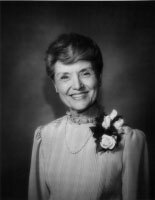 She was a Trustee of the Foundation for Floriculture of the Society of American Florists (SAF) and a member of the Education Committee. She was an active member of the American Academy of Florists (AAF) serving as co-chairman with Burt of Chapter 9. Patty was active in local community organizations, as well as serving in various capacities at different times in the Santa Maria Christian Science church including Reader, Board member and President, Sunday School teacher and superintendent, and attendant in the Christian Science Reading Room. She is a past member and president of the PTA, Soroptomist, and Minerva Clubs. She served as a board member and officer of Santa Maria Valley Beautiful. For eight years she was Campus Counselor at California Polytechnic State University, San Luis Obispo, with the Christian Science College Organization, and Trustee of Asher House at Cal Poly. Patty was a Board member of the Visiting Nurse Service of Halecroft, Inc. for the Tri-Counties, member of Friends of the Santa Maria Library, Santa Maria Valley Historical Society, the Santa Maria Valley Humane Society, the Santa Maria Valley Chamber of Commerce, the Industry Education Council, and a charter member of the Advisory Board of the Central Coast Literacy Council. Born in Seattle, Washington, Patty was raised in Pasadena, attending public schools and graduating from Pasadena City College. She continued her education as a business and speech major at the University of California, Santa Barbara (UCSB). There she met Burt and they were married in 1949. Patty and Burt Trick had two sons, Terry Allan and Tracy David. David passed on in 1984, leaving a son, Daniel, who now resides in Connecticut. Allan married Alina Marcilla in 1985. They and their daughter, Stephanie, live in St. Louis, Missouri, and Indio, California. In 1992, Patty married Albert Hooning, Administrator of the Arden Wood Benevolent Association, a Christian Science nursing, residential facility, and retreat which she and Burt had visited many times during their business career. Located on 16 beautiful wooded acres in San Francisco, it is housed in a six-story classic French chateau structure designed by the renowned Bay Area architect, Henry Gutterson (who was, coincidentally, Patty's great uncle). Prior to Al's retirement, Patty served as a volunteer at Arden Wood, including a time as its Volunteer Director. In 1994, the couple moved to Palm Desert in Southern California, where she became an active member of First Church of Christ, Scientist, Palm Desert, including President of its Executive Board of Directors and co-founder of “Caring For One Another,” a non-profit outreach program serving Southern California. Private family services were held with private inurnment.